Designing something consistent with an established aesthetic is not always a cakewalk. There are many obstacles, frustrations, and moments you just want to rework everything from scratch. For the friendly, regular fish in Flotsam, I’ve had to overcome every one of these annoyances. These fish don’t affect gameplay as much as other aspects of the game, but they provide a valuable visual addition, as they’re one of the main moving environmental features that tie the mood together. 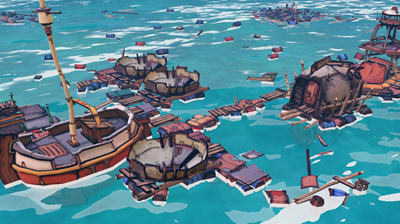 Here’s how I designed a small part of the living environment of Flotsam. 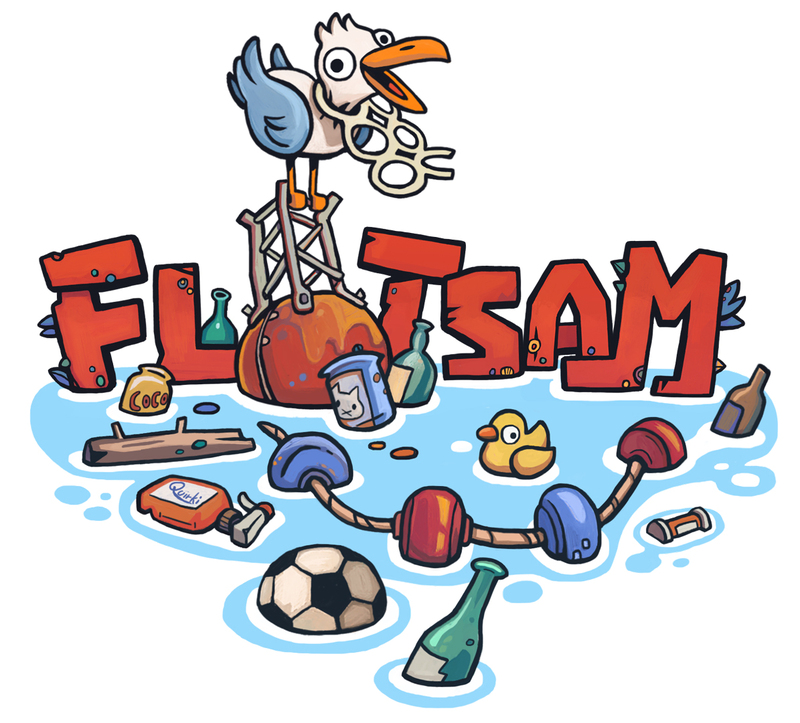 When we started Flotsam, we explored a lot of different styles in search of the perfect aesthetic. Every illustration or sketch had to capture the essence of the world we wanted to portray. Putting what we had in our minds to paper took a lot of exploration to get just right. While our priorities lied with the core components of the game, like buildings and characters, fish occasionally found their way into the brainstorming process. I started off with a basic mood-board of regular and exotic fish familiar to everyone. Then I iterated upon these designs over and over, refining them with every step. I needed to find a fish that would fit all the ideas I had about what feelings Flotsam should convey. The first sketches I made were very realistic, but they quickly felt too bland: nothing about them was memorable. This was the first layer of exploration I had to get out of the way before eventually finding more interesting aesthetics. I played with the anatomy, enlarging the eyes and simplifying the body shapes, and playing dress-up with different kinds of fins. I mixed and matched other animal and insect parts to create fun concepts, like this guy below who’s head is inspired by a beetle’s shell. Unfortunately, nothing good stood out: these fish just didn’t speak to me the way I had hoped. I still wasn’t happy with the style, and decided to explore it further, but for now I moved back to concepting more pressing parts we needed for the prototype. While working on the first prototype, inspiration suddenly struck me with a pleasant fish design. Since the human characters for the game were starting to take shape, this carried over to the fish as well. A small unrelated inktober sketch gave me some ideas, and finished character concepts involving fishing gave me others, but the most enlightening moment of all was when I was busy designing the huge whales. After a couple of more sketches I was set: I knew what the fish were gonna look like. As with fish, I tried combining some of the whales with other animals, which gave birth to odd but interesting combinations. I also experimented with large fins and tusks to see how far I could push the quirkiness. We liked some of these a lot already: the dog-whale seemed like an interesting concept to take further, and was received positively when we initially showed it to people. But it’s only when I drew the whale with a subway car around it, that an idea dawned upon me. To fully maximize the effect of Flotsam’s over-arching theme, we need the wildlife to live in symbiosis with the garbage. As it’s not only important to human survival but marine fauna as well. The roadblocks we came across here were mainly focused on readability, as we don’t want the player to be distracted by small fish, but still incorporate trash and garbage in the design. The next step is going to be making 3D models based on these sketches, and iterating on them once again to solve the problems that will inevitably arise from the switch to three dimensions. I honestly can’t wait to see these guys swim! On the gameplay side this decision had effects as well: now it makes sense to receive small amounts of trash from catching fish. This will also allow us to balance survival and building subtly, for example by reducing the amount of food a particularly contaminated fish gives. It also helps to blur the lines between various resource types, like food and scrap. We’ll have to see where this approach takes us, but here are some sketches that explore the possibilities for modularity within the fish models. The fact that all these different heads have parts covering the neck area, means they are more easily applicable to other bodies. Without having to worry about ugly seams or problems with smoothing groups/UV’s. Fish are not the only creatures that will receive this treatment of integration with their environment: I have many ideas on how to apply this principle of merging with garbage and waste in other marine beings. In the world of Flotsam, now that the environment has become unfruitful, new and unexpected symbiosis will emerge between water creatures and their surroundings that I can’t wait to share with you all! Below you can see a sneak peak of a fat sardine model. Stay tuned for more and thanks for reading!